When you are looking for something hearty and comforting for breakfast, lunch, or even dinner, omelets are a perfect meal for any three of those. It is versatile and can be switched up easily with just different fillings and toppings. 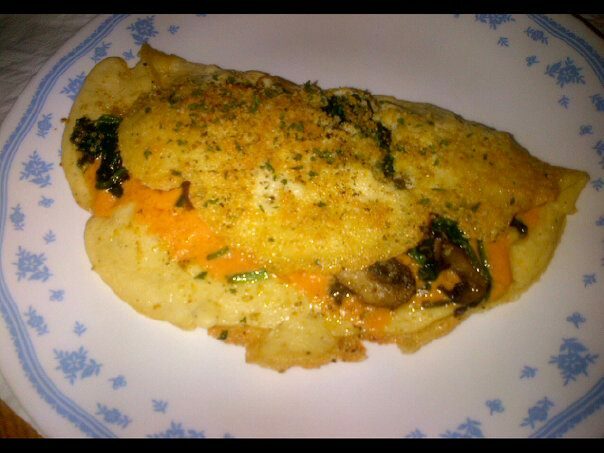 I personally love anything with spinach and mushroom...add garlic and I am in heaven, but with this "egg" outside the skies the limit on what you want to fill it with. Serve with your favorite breakfast sides or even a salad and you are all set for any meal, any time of day. Enjoy! Place all your "egg" ingredients in blender and blend all of the ingredients until liquidized, lump free and smooth. You can also use an immersion blender. Set aside and wait for cooking. In a small to medium skillet heat a pan with oil on medium high heat and add mushrooms and cook until slightly softened and golden, 5 minutes. Add garlic and seasonings and cook until garlic is fragrant about 1 to 2 minutes. Once mushrooms and garlic are combined add your spinach and cook done until spinach is wilted and soft, about 3 to 5 minutes. Taste for seasoning and add if desire. Remove veggie mixture from stove and place in a side bowl and wait to use in omelet. Heat a small to medium skillet with oil/vegan butter to coat the pan. Pour half of the smooth "egg" mixture into the center of the pan and use a spatula or spoon to spread it into a large circle evenly without breaking it. Cook for five minutes or until lightly golden on the bottom, flip to other side and cook until the other side resembles the first. Once both sides are cooked, pile your filling and vegan cheese on one half of the omelette and lightly fold the other half over. Press down light with you spatula and leave to cook few minutes or until cheese is melted. Carefully slid out of the pan onto your plate, sprinkle with more parmesan and/or herbs. Add more salt and pepper if desired and serve with your favorite breakfast sides. Enjoy! One thing I used to eat all the time before I was vegan were omelettes. I'm definitely going to try this.